We're not scientists, but we're pretty confident in our super-accurate theory on how most people use electronic keyboards in their waking life. Namely, the musician-at-heart walks up to one, switches it on, finds the kitschiest beat in its midi library - studies say it's "salsa" 100% of the time - bangs out some nonsensical melody on the plastic ivories, laughs, presses some more buttons just to see what they do, maybe switches to a different style - perhaps "reggae" - presses some more buttons, has a sensible chuckle, and then powers the whole thing down. We defy you to disprove this theory. It cannot be done. It's bulletproof. 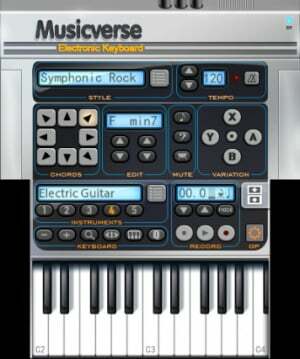 In fact, our theory is so amazing that it holds up completely under Musicverse: Electronic Keyboard. Perhaps it's a testament to Musicverse's emulation of its instrument that this package never quite reaches beyond being a curiosity. Electronic Keyboard's instrumentation covers two interfaces that replicate the real deal: by default, the top screen is for Styles and the lower screen is the Keyboard (you can switch them around all you'd like as needed). The Styles interface offers control over various rhythm styles (akin to genres, like reggae or dance), mutes, and the tempo. Each of the styles has three variations (basically, beats) of varying complexity, which can be switched between using the face buttons or touch controls. These variations have pre-determined tracks for accompaniment, bass and drums, and you can choose to mute each and every channel as decreed by your artistic vision. Tempo controls let you dial in to your desired song speed, and an optional metronome can help you keep pace as you noodle about with the keyboard. Electronic Keyboard circumvents the 3DS hardware's whole lack of multitouch thing with eight programmable chord buttons. While they don't allow you to press three keys and perform an augmented C#, you can switch between chords that will then alter how each key sounds when played. A key scale button highlights the keys that sound well together along the current chord. This isn't the most intuitive of solutions and requires a little brain retraining to get right, but ultimately it does solve the single-touch problem. That about covers the "Electronic" portion of Musicverse. The "Keyboard" part has a few more switches and doodads to tinker with - aside from the actual keyboard itself. Five "instrument" buttons let you swap between different types of, well, instruments of your choosing that you can then play via the keyboard. To actually play a note, simply tap the keys. Easy peasy. Other features include a quantize tool to automagically align your notes to the beat when recording, and another lets you bend the pitch of a note. Two octaves on the keyboard are visible at a time, and you can move up and down the keyboard with the zoom keys. 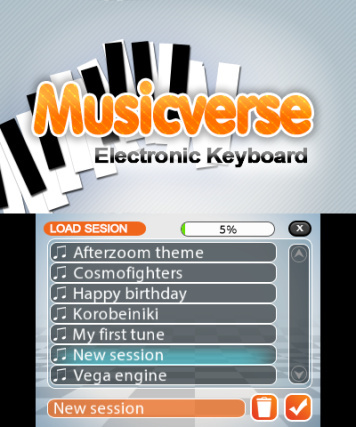 The "verse" part of the name alludes to Miiverse, to which maestros can upload their works for all (with this application) to hear. This part is fairly neat and works relatively smoothly to boot. Record your work, save it, and upload. Your saved creations can be exported to the SD card in AAC format, uploaded to Miiverse, or put on Facebook or Twitter via 3DS Image Share. You can also browse Miiverse creations from within the app, and if you dig one in particular then you can download the arrangement and mess about with it yourself. Something of a bummer is that Electronic Keyboard's documentation is limited to a series of five videos. These videos do a solid job of providing an all-at-once overview of the application's features and how to use them, but are of limited help if you want to look up info on a single feature. To get the information again, you have to sit through the whole video. To top it all off, there's no way to pause or scrub through the videos, so if the information happens to come at the end then you have to sit through the whole thing. Pray you don't miss it. 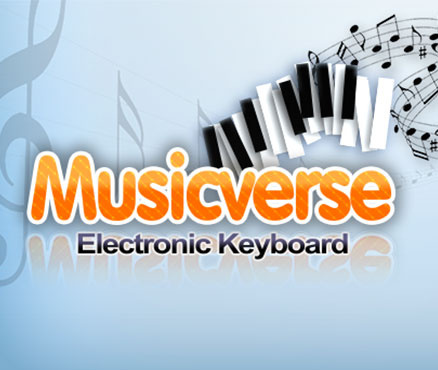 Musicverse: Electronic Keyboard is a neat novelty, but doesn't hold up particularly well as a serious instrument. It's relatively simple to grasp, no doubt easy for beginners to pick up and get noodling without having to worry too much about getting flooded with musical minutiae (although heaven save you if you need to look up how to use a feature). However, this same simplicity creates a low ceiling that experienced or ambitious performers will bump up against pretty quickly. This is no Korg M01D or DSN12 setup, nor does it approach the musical variety and depth of the Rytmik series. Electronic Keyboard is an interesting curiosity, but not something worth sticking with when there are better options on the platform. I was so dissapointed when I found out I couldn't do sequences with this thing. Still, it has some good sounds so it's worked for me when I got a melody in my head and I just want to record it for later use in a real DAW. Hmm. 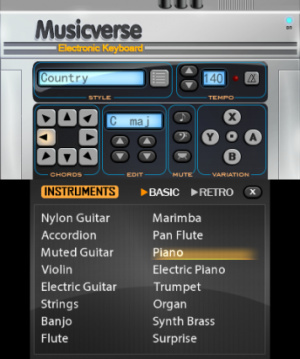 The apps failed to impress me back then, althrough I was curious how the formula was improved in Musicverse: Electronic Keyboard. Seems like it's a nice app but you can't do much with it.